Mr. Bertin Batalien was born on May 3, 1976 in Barbe, Haiti, to the parentage of Bernard Batalien and Rosita Gabriel. Compassionate, hardworking and loving are just a few words to describe a remarkable man. He was a dedicated husband & father in all a great family member who wanted the best life he could provide for his family. Bertin loved his family and his family loved him and cherished him in return. We know that he is gone in the flesh, but he will always be in our hearts. Bertin’s kindness can never be replaced. We grieve deeply because he is no longer with us. However, we are grateful the Lord blessed us with his presence for 42 years. We will miss him dearly and he will remain in our hearts forever. 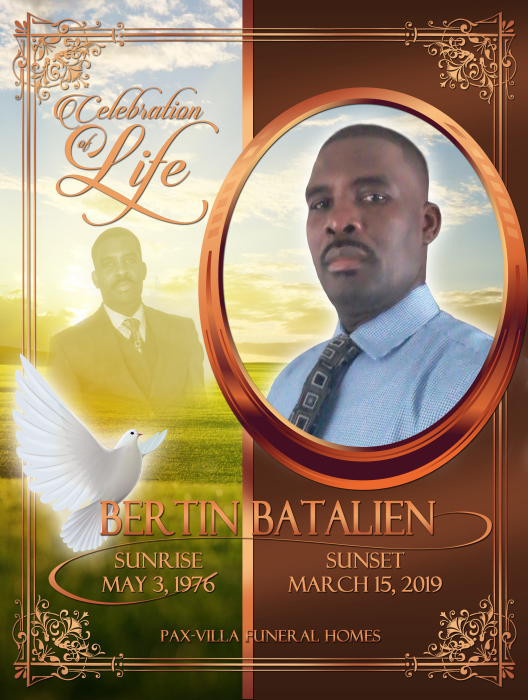 On Friday, March 15, 2019 Mr. Bertin Batalien was called Home to be with the Lord.